Kathy Freston is a renowned wellness expert and author of four books including the New York Times bestsellers, “The One” and “Quantum Wellness”. Her latest book, Veganist: Lose Weight, Get Healthy, Change the World, outlines the benefits of a vegan diet for improving your health, protecting the environment and enhancing spirituality. Freston says that a veganist is someone who eats a plant-based diet, not just for its effect on improving personal health and wellbeing, but also for the positive benefit for the ecosystem. She adopted this lifestyle in her thirties in a gradual way and in this book she shows readers how to lean into the veganist way of living. The book includes ten chapters focusing on the following subjects: weight loss, lowering disease risk, longevity, food poisoning, environment, world hunger, animal suffering, spirituality and human evolution. The benefits of eating a vegan diet are explained and supported with scientific research, expert opinions and real life success stories. Dieters are provided with step-by-step instructions outlining how to become a veganist in a gradual way. Kathy Freston says that you don’t have to stop eating meat and animal products all at once, but you will learn to gradually reduce your intake of these foods. Included in The Veganist is a three-week sample menu based on the meals that Freston typically eats. She highlights the fact that a vegan diet can actually contain a lot of variety, contrary to what many people believe. Recipes are not included but there is a section in the back of the book with recommended vegan cookbooks. Fruit, vegetables, tempeh, tofu, seitan, beans and legumes, almonds, walnuts, peanut butter, flax crackers, brown rice, millet, quinoa, whole grain bread, whole grain pasta, avocado, soy milk, soy cheese, veggie burgers, tofurky, tofu ice cream, 70% dark chocolate. In The Veganist, Kathy Freston says if you want to lose weight faster the healthy way to achieve this is to do more exercise. Regular exercise burns calories, raises your metabolic rate and reduces the risk of osteoporosis. A combination of strength training and aerobic exercise is recommended but most importantly you should choose an activity you enjoy because you are more likely to continue to do it over the long term. 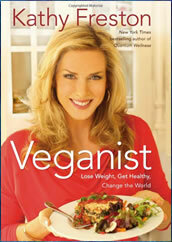 Veganist: Lose Weight, Get Healthy, Change the World retails at $25. Encourages the consumption of whole grains, legumes, fruit and vegetables. Vegan diets reduce the risk of cancer, diabetes and heart disease. Promotes a gradual changeover to a plant-based diet. May help you live longer. Veganist includes a three-week meal plan. Provides a list of recommended vegan grocery items. Vegan diets have a positive impact on the environment. Will appeal to readers interested in enhancing spirituality. Some readers may prefer not to eat a vegan diet. Veganist advocates the use of processed soy products. Does not provide specific exercise recommendations. Veganist will appeal to readers who are contemplating making the change to a plant-based diet. The book includes step-by-step instructions that will allow you to gradually adopt a vegan diet to improve your health and support the environment. In addition to emphasizing the benefits for personal wellbeing, Kathy Freston also discusses how becoming vegan can enhance the spiritual aspects of your life. The Lean Diet– Kathy’s newest book which uses a 30 day plan to help people lose weight by gradually eating more plant based foods. Freston, K. (2011). Veganist: Lose Weight, Get Healthy, Change the World. Weinstein Books.